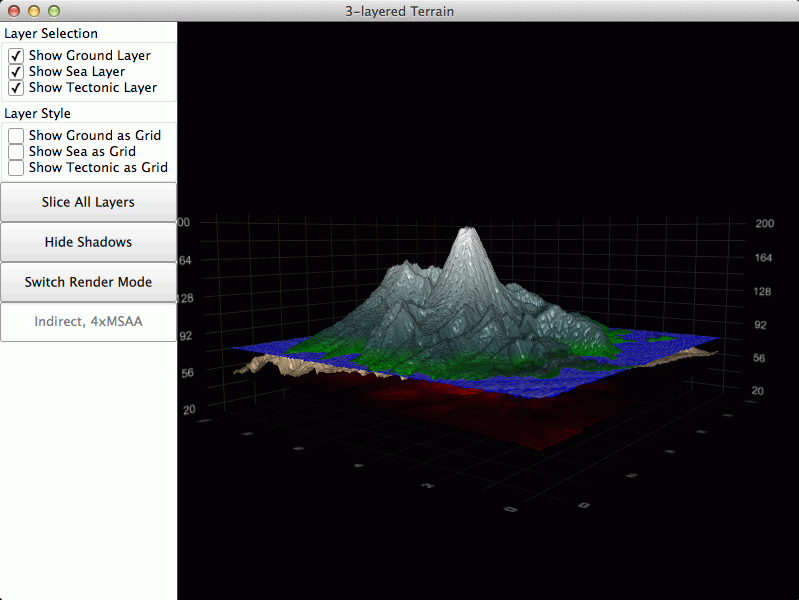 The Qt Quick 2 surface example shows how to make a 3D surface plot displaying 3 layers using Surface3D with Qt Quick 2. The focus in this example is on generating a multiseries surface plot from 3 different height map images, so in this section we skip explaining the application creation. For a more detailed QML example documentation, see Qt Quick 2 Scatter Example. This example shows how to add several surface series to one graph using using HeightMapSurfaceDataProxies and how to control their visibilities individually. text: "Show Ground as Grid"
text: "Show Sea as Grid"
text: "Show Tectonic as Grid"
text = "Slice All Layers"
text = "Slice One Layer"